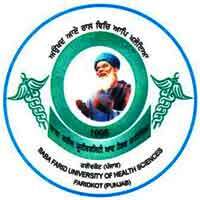 BFUHS Jobs Recruitment Notification 2019.Baba Farid University of Health Sciences (BFUHS) inviting applications for the positions of Staff Nurse, ANM, Pharmacist, Radiographer.Interested and Eligible candidates can apply for the positions. Last Date for Submission of Application is on February 22nd, 2019. Click on the career section. Look around for “BFUHS Recruitment 2019 for Staff Nurse, ANM, Pharmacist, Radiographer Posts“. Click on the submit button for final submission. Save and take print out for future use.